Virtual reality is still an emerging technology. VR headsets are not in every home, like the television. The headsets are not bundled with PCs. The technology is still changing, adapting, and evolving like mad. It makes sense that all kinds of theories are going to be made about it, with some being wrong and right. The theory I want to suggest is that smaller, quirky games are going to have a greater influence on the staying power of VR than their AAA counterparts. That's not to say that AAA VR games are completely pointless and won't have an effect on the industry. It just feels like they're going to have less influence than we may have originally thought, perhaps popping in the backseat. AAA games in VR are going to be the household names. Take The Elder Scrolls V: Skyrim VR and Fallout 4 VR, for example. These are titles that people have known and loved already. When a VR version of them releases, the hype is real. Even more importantly, the audience (and buyers) are already there. AAA titles will get everyone and their mother talking about VR, and a great many of them will buy it too. But what happens when the novelty wears off? When you've explored all of Skyrim and seen all the locations that Fallout 4's Boston has to offer? You'll probably put that headset down and move on to other games or pick up the non-VR version of the titles for some chill couch gaming. Why stand and put physical effort into shooting down dragons or Radroaches when you can just veg out and relax? That argument will probably be harder to beat after you've gotten over the novelty of a VR game. AAA VR games will get the word out and will have people buying, but it might not hold their interest. So what will then? I think quirky titles that rely entirely on the medium's unique perspective will give it its staying power. Sure, it's fun to swing a sword in VR, but you can do that with a controller. You know what you can't do with a controller? Play a rhythm game that is entirely based on the ability to slice blocks place in varying locations within a 3D space. The VR title I'm thinking of here is called Beat Saber, and it reached some fantastic milestones even while in early access. This is a game that relies very heavily on the very concept that might wear off with some AAA titles. 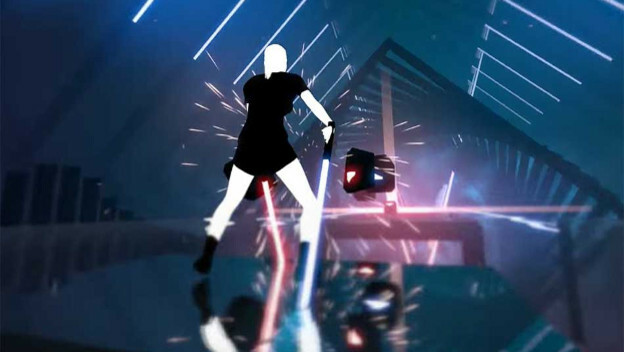 In Beat Saber, you have to slice blocks that are speeding towards you with two lightsabers. The direction that you slice the block in and color lightsaber you use is just as important as where they are. With Beat Saber, there's no option to move past the “wow” factor. There's no mobile or console version that you can try to play with a controller or a touch pad. You rely solely on the VR headset and controllers . Some might think not having options might be a bad thing. But in the case of a brand new technology, this is exactly what it needs. It certainly helps that Beat Saber is a ton of fun to play and has really catchy music to go with it. The replayability factor is only limited to how long it takes you to get sick of a song. Quirky games that take full advantage of the mechanics VR has to offer will keep the technology from fading away. AAA ports or games that release on other platforms give their customers plenty of options (because that's good business), but it doesn't create a sense of urgency for anyone to buy VR. So my thinking is that smaller developers should really try their hand at VR, they could be the future of the technology. What do you think?